We all had two days off in between changing duty rotations, and so we went to one of what’s known as the Turtle Islands. The islands are so named because of the many turtles that swim in the waters around them and they are also the place where green turtles and hawksbill turtles lay their eggs on the beaches. Throughout the year, they come ashore at night to lay their eggs, and by visiting these islands people have the rare opportunity to watch this happen. There are 10 small ‘Turtle islands’ in the Sulu Sea, of which 3 belong to Malaysia and 7 belong to the Philippines. Pulau Selingan, the largest of the islands, is where we stayed, and it has a turtle hatchery, tourist accommodation and basic facilities. What I didn’t mention to my family beforehand is that the FCO (The Foreign and Commonwealth Office) states that the islands off the coast of Eastern Sabah are considered dangerous and advise against all but essential travel ! 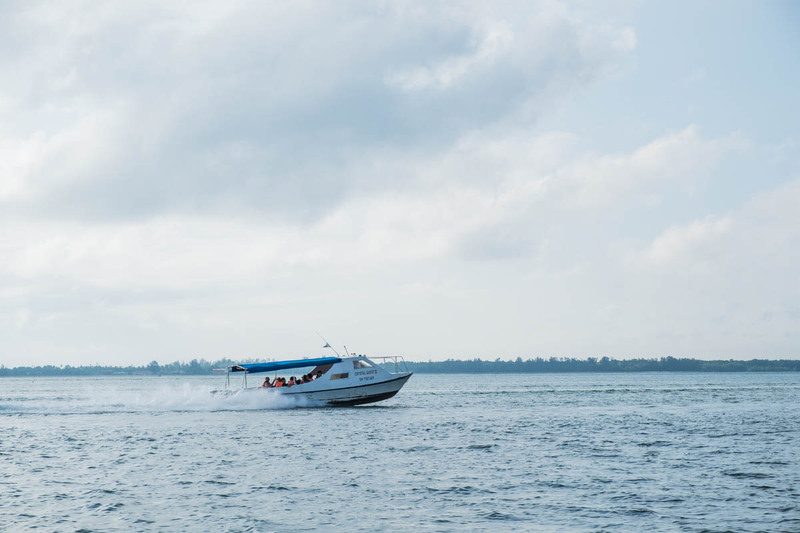 However this advice has not changed in over a year, and since the Malaysian police and navy intercepted an attempted kidnapping in December 2016, there has not been a single reported or attempted kidnapping from Malaysian waters. There is also a big police presence on the island with binoculars on tripods looking out to sea for possible pirates, so we took a calculated risk and booked the trip! Obviously the policeman below however doesn’t think there is too much of a risk! The day of our trip dawned grey, rainy, and with thunder & lightening 😦 The journey there involved a speedboat ride that took about 45 minutes, and I had visions of us being soaked to the skin. I triple wrapped my clothes and camera in plastic bags, but thankfully the boat was covered and also had a completely enclosed area to put our belongings. 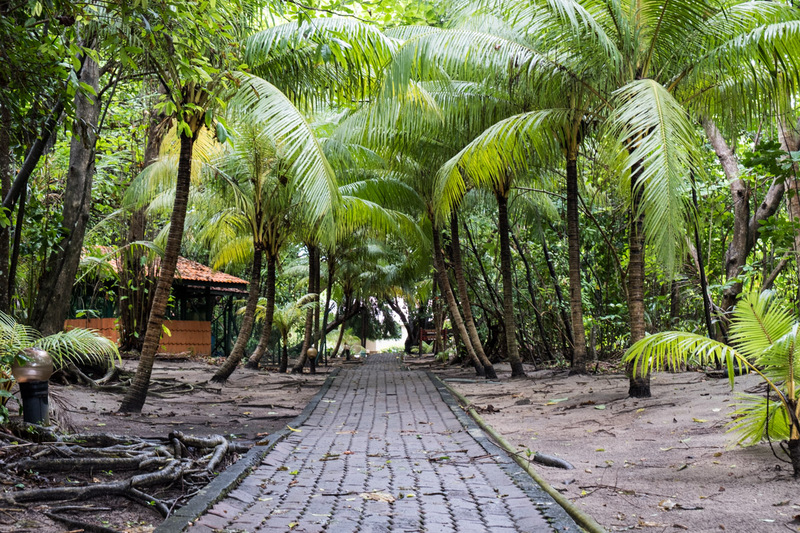 When we arrived we walked along a pathway that led to our rooms, which were basic but clean. Several of us immediately went snorkelling. Although it was still raining on and off with occasional rumbles of thunder the sea was lovely and warm. I’ve never seen so much coral, but as is usually the case now, sadly a lot of it was dead. There were many tropical fish and colourful clams however, I found Nemo (several times) and I borrowed an underwater camera and managed to get some shots in focus – not easy when there was a slight current and I kept drifting away and had to constantly move to stay in the same spot! When I’m snorkelling I always wear a thin top over my swimming costume otherwise I would burn badly. The pathway to the rooms went past the turtle hatchery, and this is divided into two different areas. One is under the shade of large trees, and the other is out in the sun. The reason for this is that all the eggs under the trees will become male turtles, and the eggs that will have been incubated at a higher temperature out in the sun will turn out to be female. The female turtles that survive to adulthood will return to the exact same beach years later to lay her own eggs. Nobody except the rangers are allowed on the beaches from 6 p.m. to 6 a.m., as the turtles usually only come ashore at night. When a turtle has come onto the beach and is laying, a ranger will scoop the eggs up as she lays them and transfer them into a bucket for burying later. Turtles are very sensitive to disturbance, which may prevent them from laying their eggs. 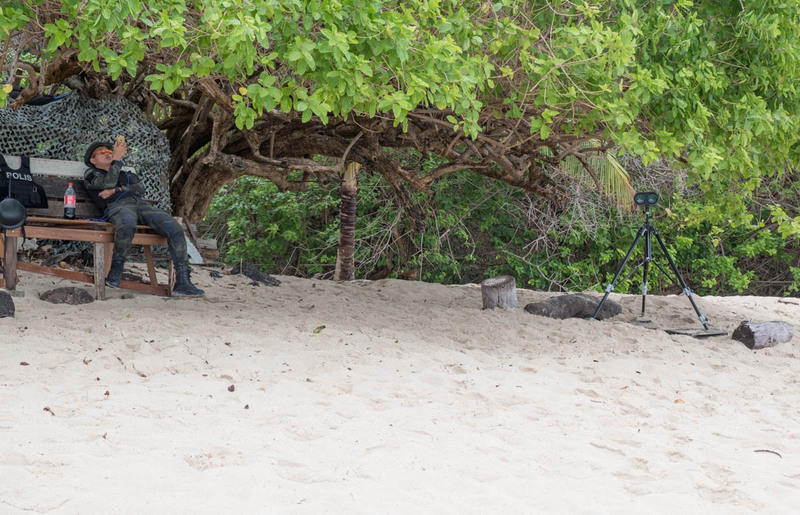 The people staying on the island have to wait until a ranger radios through that the first turtle is laying and we all go together to watch. We are only given the signal after she has been laying eggs for a while as by that point she is highly focused on nesting and our presence is less likely to disturb her. No flash photography is allowed, only her rear end is lit with a torch and we are not allowed to stand in front of her head. As soon as she finishes laying, she starts scooping the sand to cover the hole and this is when a torch is shone onto her body and we are allowed to photograph her properly. The ranger brushes the sand off her shell to check for barnacles, and if any are found these will be removed as too many will weigh her down and she will have difficulty swimming. 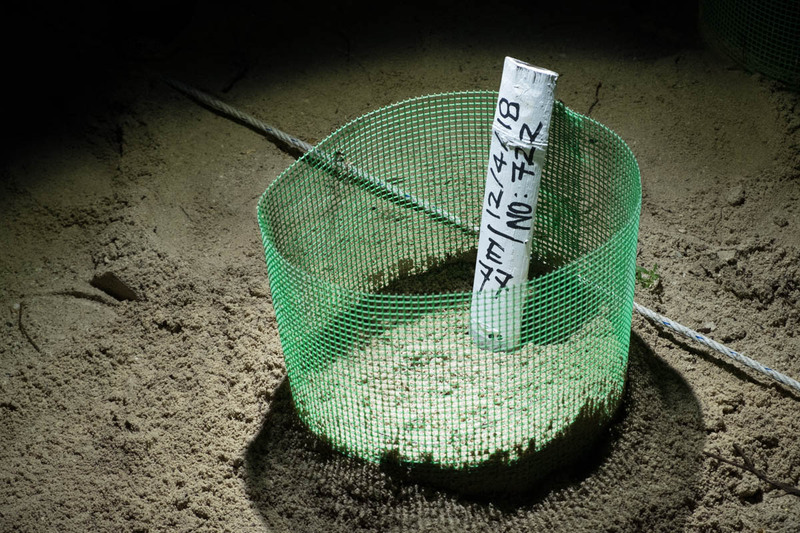 Each turtle that comes ashore is tagged, the shell measured, and her details recorded. This particular turtle was a first time returner, so we watched as she was tagged on her front flippers and we then left her in peace to return to the ocean. Next we went to the hatchery to see the eggs being buried and marked. They are protected by a fence around the whole area, and also individually as there are snakes and huge monitor lizards that roam the island and both would eat the eggs if they could. Each new ‘nest’ is labelled with the date and number of eggs written on a sign sticking up like a plant label. 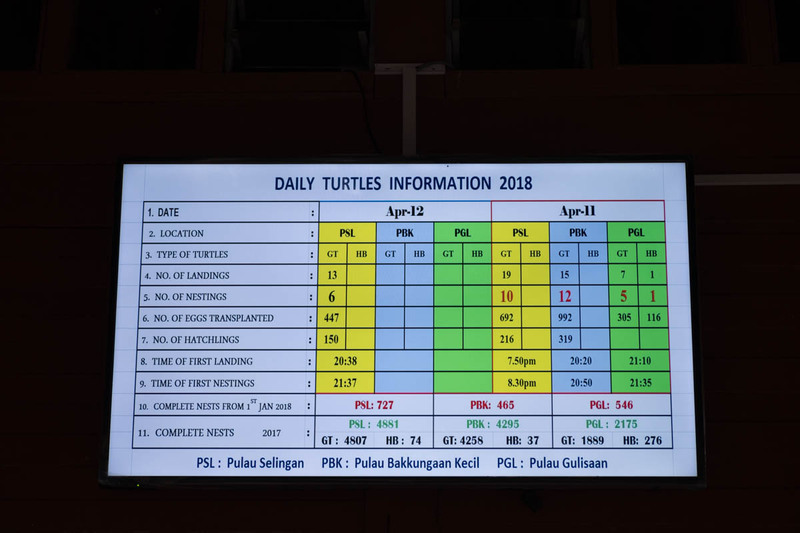 Each morning the information from the night before is displayed on a board – there had been 13 Green Turtles on the beach, of which 6 laid 447 eggs between them, and 150 hatchlings were released. The next morning we had to leave at 07.00 and breakfast was at 06.30, so by 06.00 several of us were on the beach watching the sun rise. There were still some black clouds around, but it was probably going to be a much sunnier day than we’d had the day before. Oh well, at least the thick cloud cover meant that I wasn’t burned to a crisp! We sped back to the mainland passing another small island and the village on stilts. 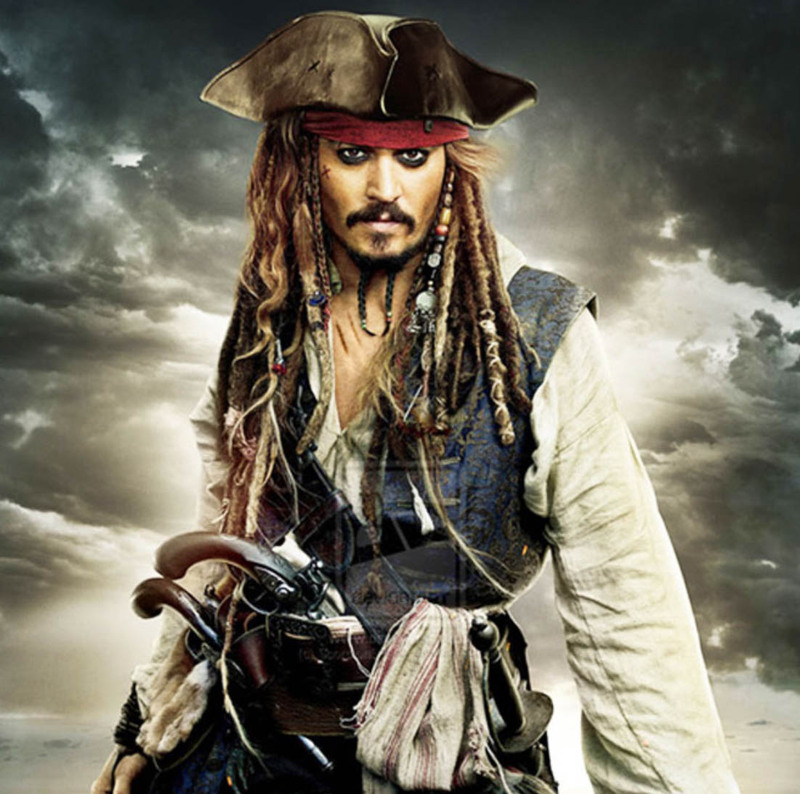 A great 24 hours, and I was rather disappointed that Johnny Depp hadn’t put in an appearance!